This entry was posted in Community, General News and tagged Owl, Southeastern Raptor Center on February 10, 2014 by Wire Eagle. 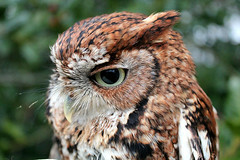 AUBURN UNIVERSITY – The Southeastern Raptor Center asks, “Whoo Loves You?” by offering a unique Valentine gift package for auction. In addition to the opportunity to name its newest resident, an Eastern screech owl, the Valentine’s Day gift package will include a private tour of the education center to meet raptor center residents including Nova, Spirit and Tiger along with a photo and certificate. The auction is open now and will close Feb. 13. To bid, go to http://www.onlineauction.com/auction/1865544. The owl available for naming is an adult screech owl of unknown gender found last November near the side of a road in Thomaston, Ala. Veterinarians said they believe it was struck by a vehicle. Mathews said the money raised through the auction will support the center’s rehabilitation mission by supporting animal care and treatment. The owl was found bleeding slightly from the ear and suffered an injury which caused the owl’s eye to lose pressure and deflate; it was brought to the Southeastern Raptor Center for treatment. Dr. Jamie Bellah, professor and head of the Department of Clinical Sciences at Auburn University’s College of Veterinary Medicine and director of the Southeastern Raptor Center, performed surgery on the bird. Bellah said he had to remove its eye to relieve the owl of pain. “Obviously, we cannot release it after that, but we can keep him as a foster owl,” Bellah said. The Southeastern Raptor Center at the Auburn University College of Veterinary Medicine has a threefold mission of rehabilitation, education and conservation. Each year more than 300 injured birds of prey are brought to the center for rehabilitation.